WHEW! Can it really be the end of another school year? This is the time of year when, stopping to catch our breath, it’s important to look back and reflect on all we have accomplished before setting goals and charting the course for next school year. I am incredibly inspired and couldn’t be more proud when I hear each grade-level team share their results of a year of hard work and dedication on the part of teachers and students. What we know by looking at the results is that more students at Rousseau School are achieving at higher and higher levels. How does that happen? It happens because of an intense focus on learning. It happens because teachers are clear about what we want students to know and be able to do, and because we use frequent assessment to monitor progress along the way. It happens because of strong instruction that helps students meet rigorous district and state standards, and extra time and support that’s provided if they’re not quite there yet. I believe we’re getting better and better results because teams of teachers collaborate, share, and plan and parents support school and learning at home. It’s been a very good year for learning and growing and I thank ALL, students, teachers, and parents, who do their part and more to make it happen! We’re making progress!! Renovation will continue at full speed throughout the summer with nearly every area of the school building involved. As a result, the main office will be relocated to the far northeast corner of the building. Summer office hours will be from 7:30 a.m. to 4:00 p.m. The geothermal well field is complete and soon the lower playground will be sporting a new crop of beautiful green grass, ready for play in August! In keeping with our focus on quality teaching and learning— right up to the final bell! – your help in assuring that the last week of school is safe and educational is appreciated. In anticipation of the final days, please see that your child does not bring shaving cream, silly string, markers, hair dye, body glitter, or any other nuisance items to school. I will contact parents should students bring such items or come to school dressed in a manner that might cause disruption to the learning environment. Our goal for the last week of school is a business-as-usual climate. We will continue to expect students to conduct themselves as they have all year – in a safe, respectful, responsible manner. 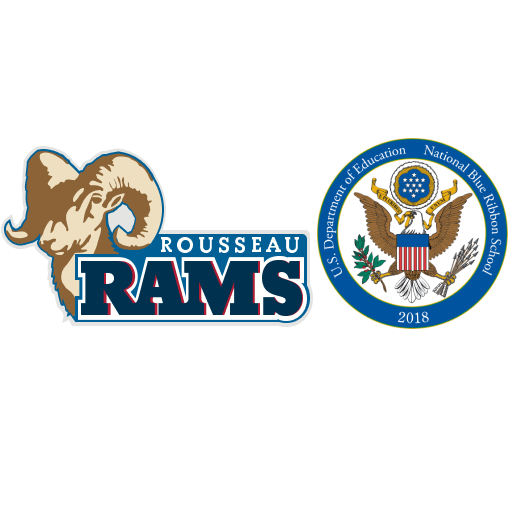 Thank you, again, for your kind support and active involvement in our important work at Rousseau School – to help students LEARN at high levels, THINK interdependently, and LEAD with character. We couldn’t do it without you! This summer, keep school skills sharp by including daily time to read and write in your child’s busy schedule AND… find plenty of time to rest, relax and have fun together. Be safe! See you in August. It was a year of growth and change at Rousseau School. Clear examples of this are the students who progressed in their academic, physical and social development the past 10 months. More changes could be over seen with the the sound of the hammers, saws and drills of construction workers. Less obvious but equally important has been the growth and change in the area of technology integration by teachers. The building is in the midst of a maturation process that began with technology as a pull-out special subject area and moves towards an approach that treats the classroom as a digital learning environment. It’s not “technology” if it was invented before you were born. Students today don’t know a world without powerful laptops, the Internet, or pocket-sized devices that access it through touch screens. As adults this is all very new and amazing to us, but to our children it is no more amazing than a remote control or an 8-track tape. As teachers, it is our job to learn about these advances and how they can enhance learning. This is a noble goal, one we are working toward at Rousseau, but evolution in any process takes time. The first year of change in approach at Rousseau focused on getting teachers more comfortable with technology. They were assisted with planning lessons that put technology into the hands of students and learned about some tools and resources that they may not have been aware of before. This was a big deal. The next year will focus on making this less of a big deal, and more of how we teach. A greater portion of next year’s staff development will be about creating the environments to help teachers and students take advantage of the substantial digital resources available to them in Lincoln Public Schools. Kelly Mitchell & Lisa Trobee, 4th grade teachers at Rousseau, who received their Masters Degree at Nebraska Wesleyan’s graduation ceremony on May 15, 2010. Alex R., a 5th grade student here at Rousseau placed 2	in the Water Conservation Poster Contest. A copy of his poster will be displayed on billboards around Lincoln. Way to Go Alex!! Representing Rousseau School at the Annual Gold Star Banquet were Peter J., 4th grade student; Janis Hiatt, Diane McDonald & Shelley Clayburn, Character Council Sponsors. Our sincerest gratitude and appreciation to 2009-2010 PTO Board Members; Jenni Jex, Lori Tackett, Kim Cook and Melanie Whitmore for your time, hard work, and dedication to Rousseau School. Are you missing jackets, coats, mittens…? I think I know where they might be! Please stop by the table in the main hall and look through our “found and forgotten” items. We’ve amassed quite a collection! Items not claimed by June 4th will be donated to a children’s charity. This poem was written by the third graders in Mrs. Mandl’s class, with the assistance of Lisa Roberts, mother of Madeleine Roberts-Ganim. It is a “10to 1” poem. It has 10 lines, with the first line containing ten words. Every line after that has one word less than the line before, counting down to a last line of one word. That one word names the person or thing that the poem has been describing all along! Lines can “wrap around,” continuing ideas from line to line. See if you can guess the one word punch line in this “10 to 1” poem before you reach the end. Rousseau would like to thank the PTO for their investment in classroom technology.